After what feels like an eternity of emotionally disintegrating in public, Bernard Tomic is somehow only 25 years old, with plenty of talent to spare, and was as recently as last season a top-30 player on tour. This season he’s been fighting to qualify for the majors, though the tortured former No. 17 player still tends to produce his most noteworthy moments on the tennis court after abandoning the fight altogether. 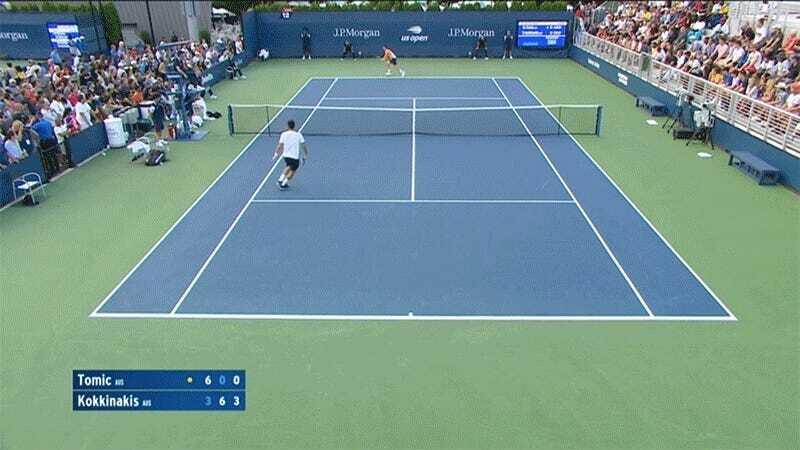 As Tomic’s effort level hit the nadir, the crowd stopped applauding points. Even Kokkinakis, a close friend, seemed sincerely baffled by Tomic’s play at times. “I came out very average, he kind of takes the energy out of matches so it’s tough to keep your energy up. He’s a tricky player, he knows how to play the game,” he told Sport360 after the match. Tomic lost the match, 3-6, 6-0, 6-2, and will miss the season’s final Slam. In January of this year he said, “I’m going to turn this around. It’s my goal to prove everyone wrong and I’ve done it all throughout my career and I’m excited for the challenge.” He’s still young, but that redemption arc only gets harder and harder to envision. It’s a shame, too—the game could benefit from his dose of junky forehand slice. Tanking Enthusiast Bernard Tomic: "I Don&apos;t Tank, I Just Get Disappointed In Myself"